WE Design is a New York City based landscape architecture and urban design firm led by Tricia Martin, RLA, LEED AP and Winston Ely, LEED AP that applies landscape architecture solutions to our city’s most pressing environmental and social challenges. Our Gardens Rising Green Infrastructure Feasibility Study was selected for a Merit Award from the New York Chapter of the American Society of Landscape Architects! 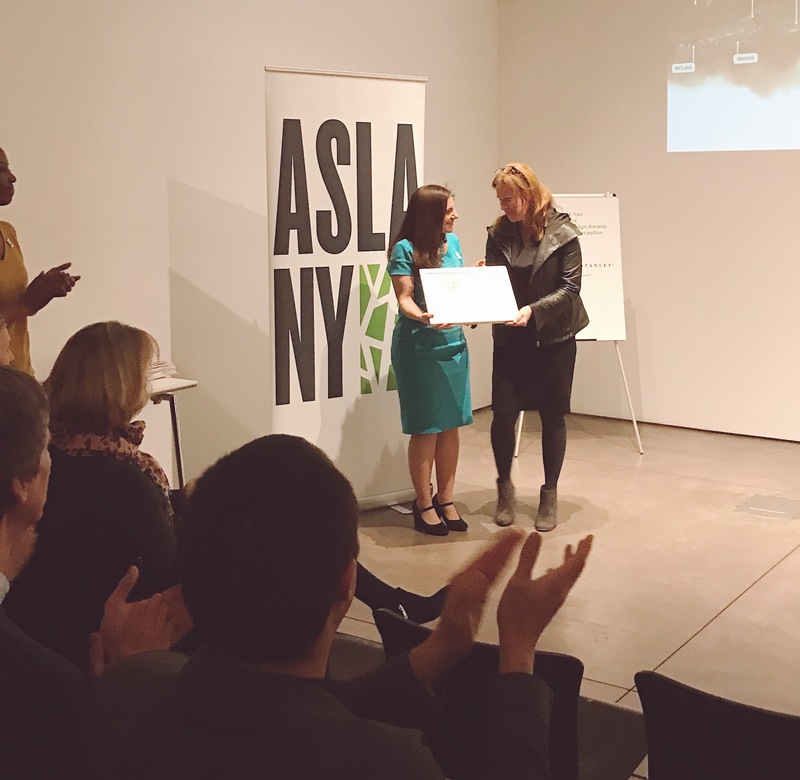 Tricia accepted the award during the ASLA-NY Design Awards Ceremony and Reception, sponsored by Victor Stanley, at the Center for Architecture in Manhattan. All of the winning projects are on display at the CFA through the end of April. El-Space: Creating Dynamic Places Under the Elevated was selected as a finalist in the Urban Design category as part of FastCompany‘s 2017 World Changing Ideas Awards! The Sunset Park pilot project at 36th Street is already underway, with more to come in The Rockaways–creating greener, safer, healthier spaces under elevated transportation infrastructure. Tricia Martin’s essay on the Brooklyn Waterfront Greenway is included as a case study in chapter 5 of “Coastal Change, Ocean Conservation and Resilient Communities” (eds Marcha Johnson and Amanda Bayley). The chapter explores how New York City is integrating storm protection and other climate change strategies into ongoing planning and design efforts in response to the devastation caused by Superstorm Sandy. This collection of essays and design case studies explores a range of ideas and best practices for adapting to dynamic waterfront conditions while incorporating nature conservation in urbanized coastal areas. The editors have curated a selection of works contributed by leading practitioners in the fields of coastal science, community resilience, habitat restoration, sustainable landscape architecture and floodplain management. By highlighting ocean-friendly innovations and strategies being applied in coastal cities today, this book illustrates ways to cohabit with many other species who share the waterfront with us, feed in salt marshes, bury their eggs on sandy beaches, fly south over cities along the Atlantic Flyway, or attach themselves to an oyster reef. This book responds to the need for inventive, practical, and straightforward ways to weather a changing climate while being responsible shoreline stewards. We learned a lot about the many benefits of community gardens during the Gardens Rising study, but this holiday season, we discovered a few more! A conceptual cross section illustrating each of the strategies in the Gardens Rising sustainability and resiliency toolkit. At a time when national environmental efforts appear to be on the verge of reversal, we must find opportunities to address the risks of climate change on a local level. One such opportunity presents itself in our own urban “back yards”: activating a network of existing community gardens to support social and environmental resiliency. 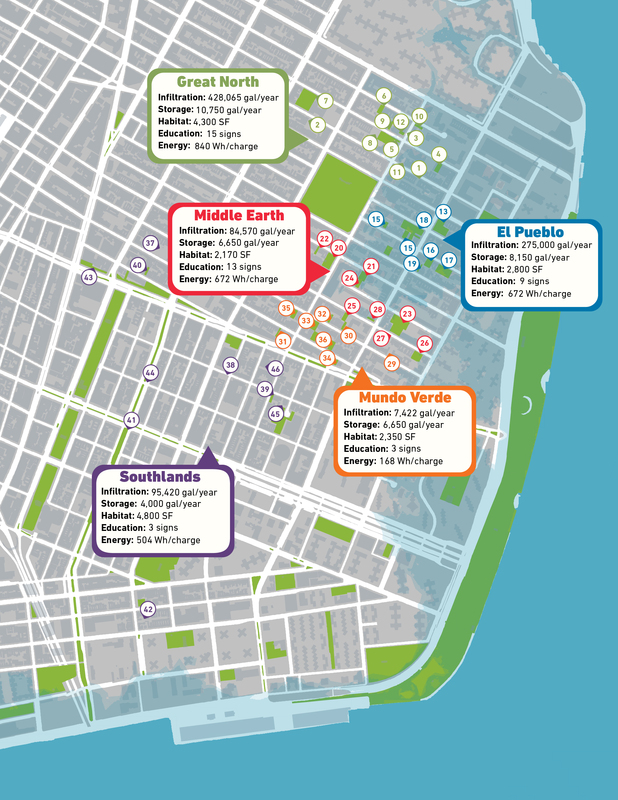 In 2012, Superstorm Sandy devastated Manhattan’s Lower East Side with inland flooding, storm surge damage, and widespread power outages. In response, members from 47 community gardens formed a coalition, “Gardens Rising,” in order to secure funds and grants to implement resiliency strategies, both to protect individual gardens from future catastrophic events, and to strengthen resiliency for the larger area of the Lower East Side. 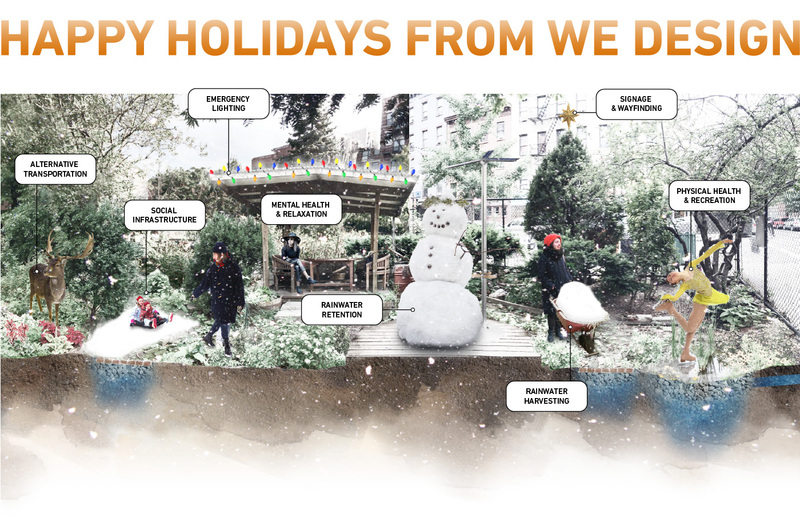 Over the course of the last six months we have been working closely with Gardens Rising to build a resiliency and sustainability tool kit for these 47 community gardens in the Lower East Side. The aim is to demonstrate, through specific hydrological metrics, the critical role community gardens can play in any city’s climate change resiliency plan. 3. Quantifiable Evaluation Criteria for each garden that includes resiliency outcomes and an assessment of the organizational structure. A net quantification by subdistrict of select benefits provided to the city by proposed sustainability and resiliency strategies. Resiliency isn’t just about controlling the flow of water. The toolkit provides a set of sustainability and resilience recommendations for each garden that have been synthesized from both technical considerations identified during fieldwork, and the expressed objectives of the community gardeners. As they are, individual community gardens already represent multiple ecosystem services: providing habitat for pollinators and wildlife, improving air quality, reducing heat island effect, and improving the mental and physical health of community residents. With the support of volunteer gardeners, community members, local government agencies, and additional funding, a community garden network could expand green and social infrastructure services to benefit the city socially, ecologically, and even financially. Due to the communal nature of community gardens, building social infrastructure along with green infrastructure could enhance the resiliency outcomes of the district even further. Lively and operative community spaces create social resiliency by bringing communities together. As social hubs, they could provision communities that are difficult for FEMA and Red Cross to access in an emergency. Vulnerability challenges such as language isolation and inaccessibility of elderly or disabled populations can be reduced when an established social network provides accountability and assistance in aid and relief. Our goal, as lead Landscape Architects for the project, is to strengthen and maximize the potential of these gardens and their surrounding neighborhood, to change the perception from “cute gardens” to critical ecological and social components in New York City’s resiliency plan, and ultimately provide a replicable model for communities around the globe. WE Design encourages you to get involved! Find, visit, and/or join your local community garden here. The AIA New York Chapter’s annual Procrastinators’ Days benefits members of the New York design community by arranging a full day of AIA/CES registered educational sessions, allowing them to meet their AIA membership and state licensing education requirements before the end of the year. Tricia participated in a panel discussion with the Design Trust’s El Space team, sharing her passion for both community engagement and activating underused urban spaces. Elevated infrastructure divides communities across New York, from train lines in the Bronx to highways in Syracuse. Negative impact of this infrastructure is well documented, but less well known are nascent attempts by nonprofits and municipalities to reclaim this ‘el-space’ for the public. Creative design and extensive cooperation between design disciplines and government agencies can transform these unique urban sites into safe, attractive, and environmentally friendly connections between communities. See the full list of courses offered here. 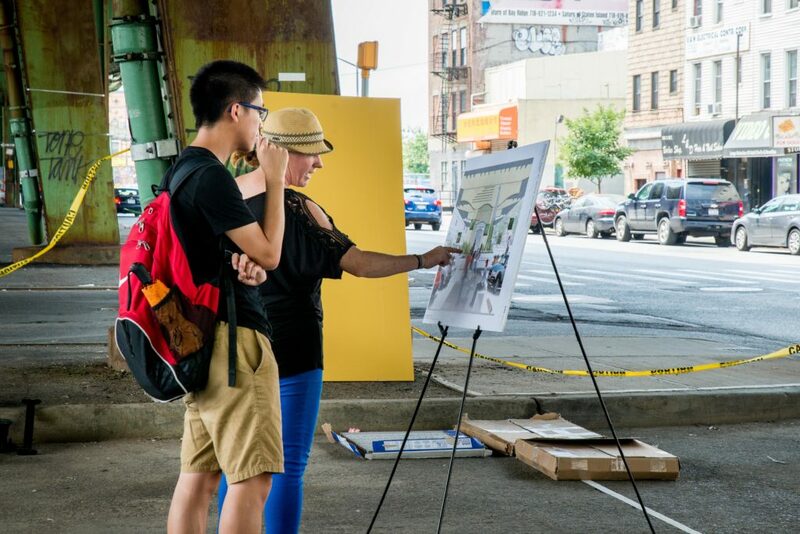 During the summer of 2015, Tricia Martin, Kaja Kühl (youarethecity) and urban design students and faculty of Columbia’s Graduate School of Architecture, Planning, and Preservation (GSAPP) Summer Studio had the opportunity to collaborate with a group of young Brownsville, New York residents on the design for a pop-up community clubhouse at Marcus Garvey Village. The residents, part of a program at Brownsville Community Justice Center (BCJC), developed a set of mental maps of their neighborhood to identify potential sites for the community center. Made in Brownsville, a local design not-for-profit, led the initial effort with BCJC that included the retrofit of a shipping container. Nicolas Fernando Del Valle Russell, one of our Columbia students from the summer 2015 studio, continued to assist WE Design with the project once a site was approved by L&M Development Partners, the owners of the housing development. Nicholas developed a site plan that included a stage for events, porous paving for paths, and a row of constructed nooks with custom benches and planters to be used for seating or other pop-up activities. The new facility will host a range of events such as movie nights, classes, and panel discussions. This project demonstrates how collaboration between many experts and people of different backgrounds can have a meaningful impact in underserved communities. Crain’s New York recently highlighted 10 “think big” projects that could help address New York City’s skyrocketing population increase, including The Design Trust and NYC Department of Transportation’s El Space Project. 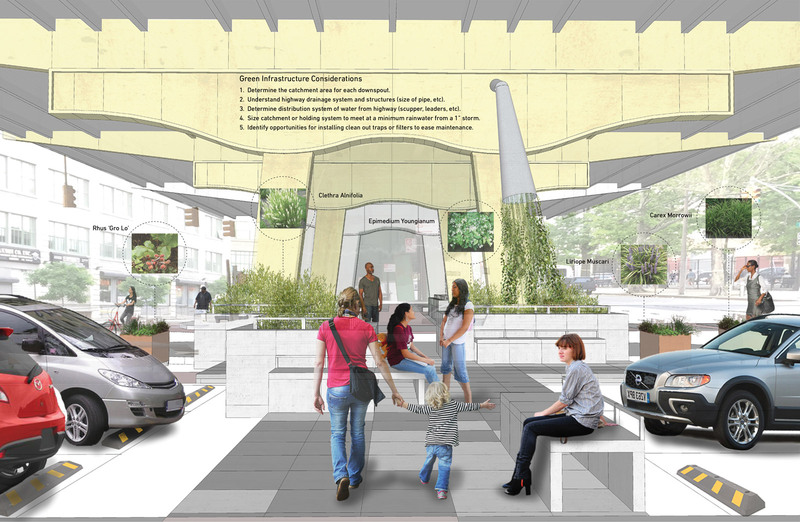 The concept, transforming unused space under elevated infrastructure into welcoming public plazas, would reconnect communities split apart by poorly lit, often dangerous underpasses, with integrated green infrastructure to address frequent flooding from highway runoff. Tricia Martin (WE Design), Quilian Riano (DSGN AGNC), and Leni Schwendinger (ARUP) are the Design Trust Fellows for this pilot project, which will provide a replicable lighting, green infrastructure, and circulation model for use throughout the five boroughs.